Activate! Aug/Sept 06. (Music, Movement and More! The Music Magazine for Grades K-6). By Kris Kropff. For Games, Unison choir (2-part choir), Orff instruments, Boomwhackers and CD Included. General, Patriotic. Book and CD. Published by Heritage Music Press (AC0806). 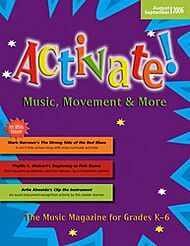 Grades K-6 * Jump into “Activate!” with a variety of new and exciting music activities for your students. Start their day off right and sing “The Wrong Side of the Bed Blues”, and get them moving with “Yankee Doodle” and “Brian Boru’s March” folk dances. Explore nature during “All the Leaves are Falling” and while playing “It’s Raining” on a variety of instruments. There are scavenger hunts, word scrambles, crossword puzzles. . .and don’t forget to celebrate Mozart’s birthday!